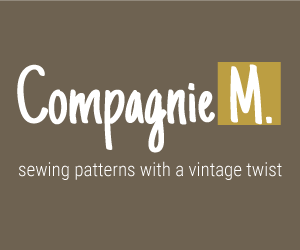 Due to the craziness of life, I missed the boat on Selfish Sewing Week, hosted by Imagine Gnats. But, since I have a moment now, I thought I’d let you in on a project I whipped up a few weeks ago for myself. Once I decided to go back to work part time, I knew that a bunch of old cardigans from Target and jeans caked with whatever was on the kitchen floor this morning would not make the most suitable wardrobe for facing a room full of undergrads. I took a look around me to see what adults are wearing these days and headed to the mall. 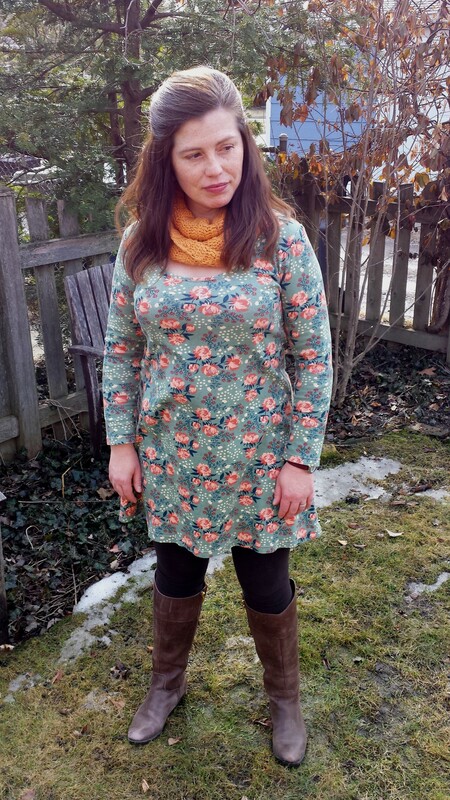 I ended up with mostly sweaters and sweater dresses that hit just above the knee and leggings, paired with boots. I really like this look — it’s stylish, easy to wear and pretty low maintenance. It’s also ok to wear while jumping on the trampoline with toddlers at gymnastics before heading to work in the afternoon. When it looked like I’d have a little time for sewing again, I decided to try and sew up something like it for myself to add to my new spiffy wardrobe. 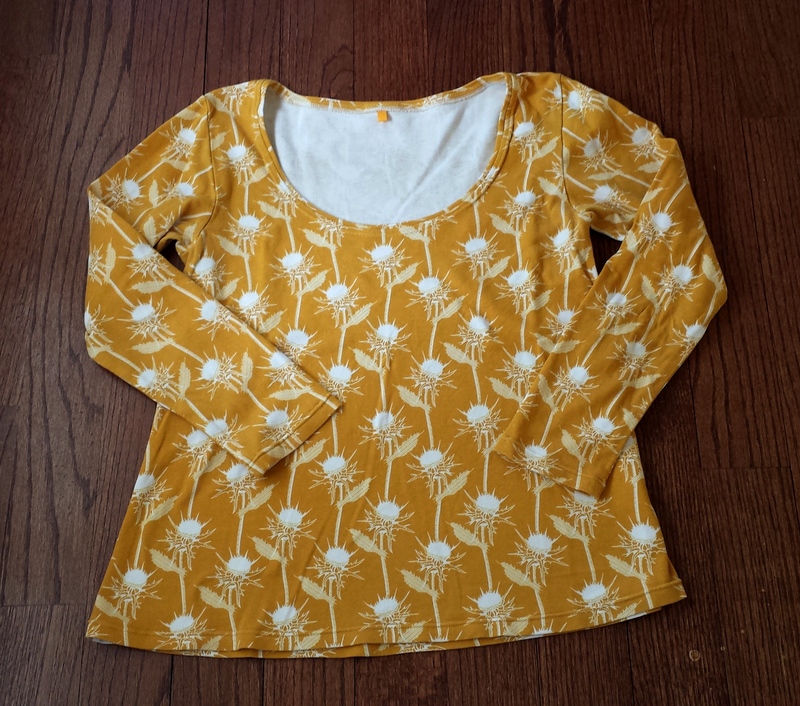 All I did to transform this shirt into a tunic was to decide how long I wanted it to be and extend the line of the pattern, following the curve. That’s it. I really like the result and will surely try it again. 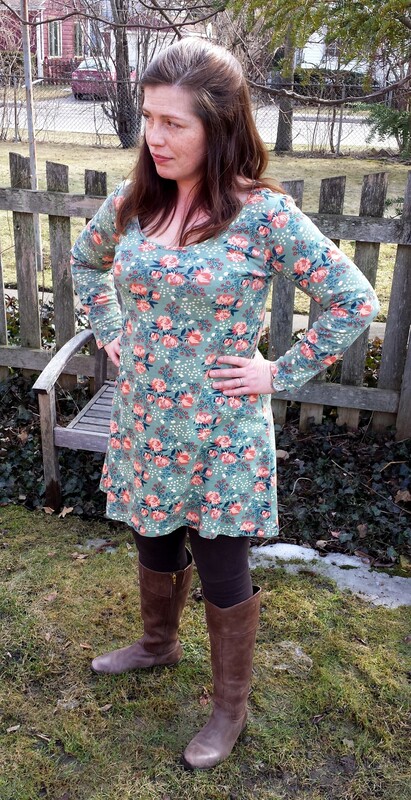 The knit fabric here is Teagan White’s Peonies in mint from the Acorn Trail line. I sewed up a size 42. 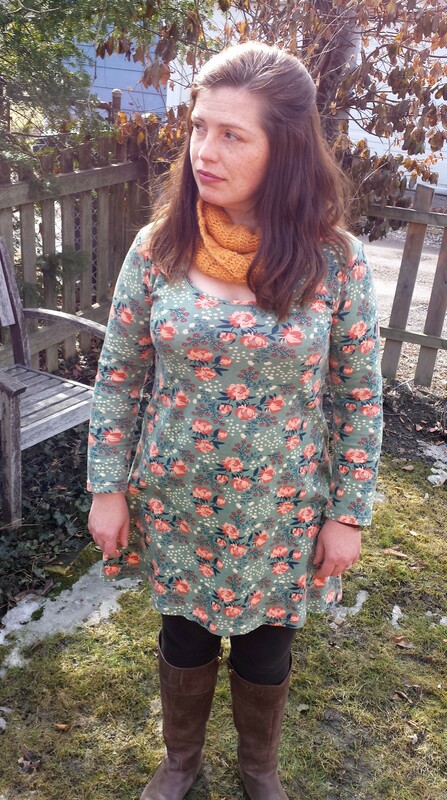 After making this with several different kinds of knit, I have run into problems with the neckline when using interlock, which is thicker and less stretchy than jersey. 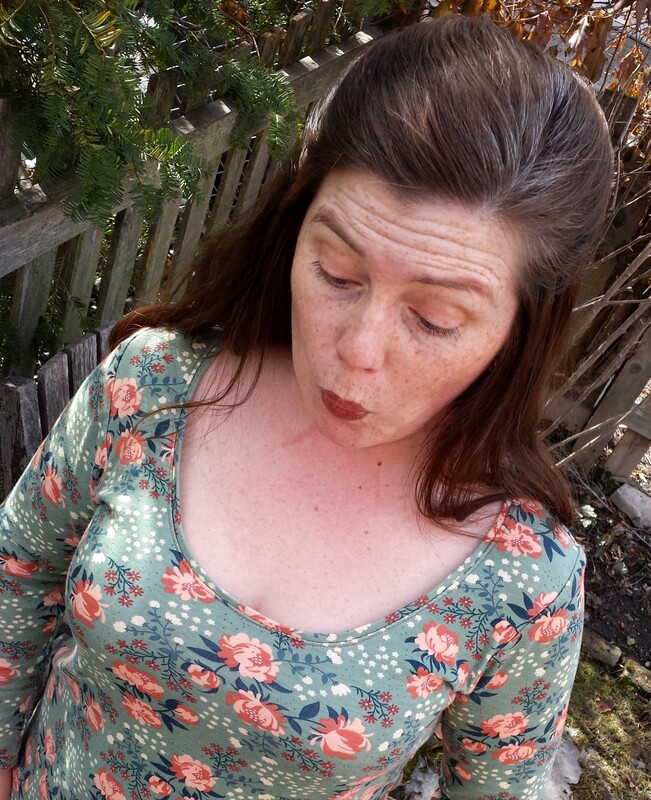 For some reason, the neckline turns out a little bit too low for me with interlock. Maybe the absence of any kind of spandex or other really stretchy stuff causes the neck to stretch out more — who knows? This happened with my last version in Anna Maria Horner’s gorgeous Mary Thistle Knit in saffron, and I thought it was a fluke. Nope, it happened again here. It’s really only a problem when I lean over. But still. I really do prefer interlock for this pattern, as it doesn’t cling as much as knit with spandex. So, I’ll just try cutting the neckline about 1″ higher next time. 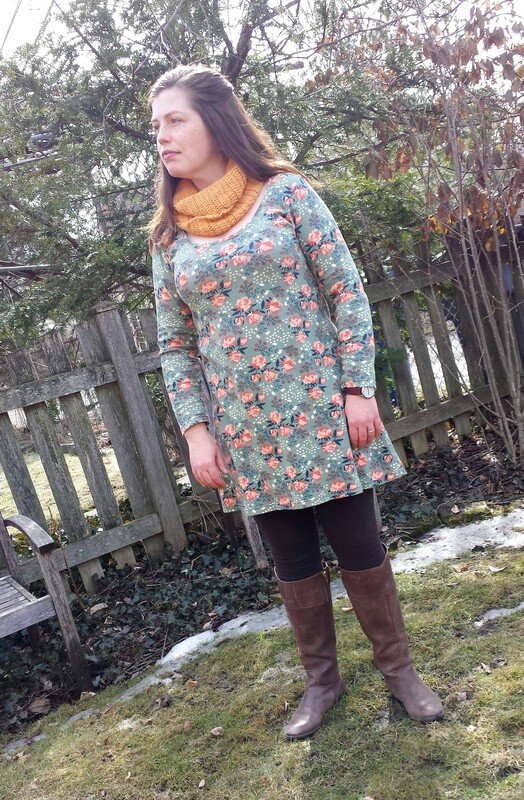 My solution with this tunic and my Anna Maria Horner top is to pair it with a scarf. Here, you see the infinity scarf I crocheted for myself last winter while I had the flu. Normally, I am not a knitter or crocheter in any way, but Delia’s pattern that showed up on her blog a year or so ago was too tempting to pass over. It was actually very easy and very fast to make. I wear it all the time, and it was definitely worth the effort. 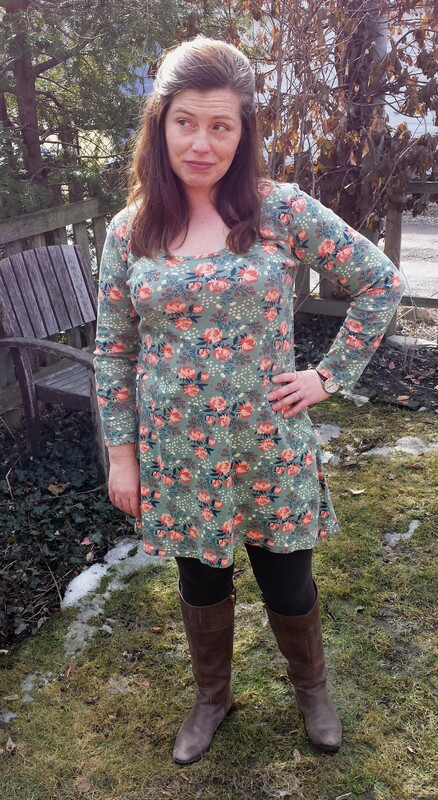 Now that the snow is just about melted around here, it’s nice to have some new clothes to take me in to spring. I have a couple of other things on the sewing table that I hope to have to show you soon . . .